You shouldn’t be using your regular Bluetooth speaker for your tailgate parties. There’s a very good chance you’re going to break it. While tailgate speakers do have some similarities to share with Bluetooth speakers, they do tend to offer certain advantages over more traditional portable Bluetooth speaker. They’ll give you the quality of sound you’re looking for at the volume you want. 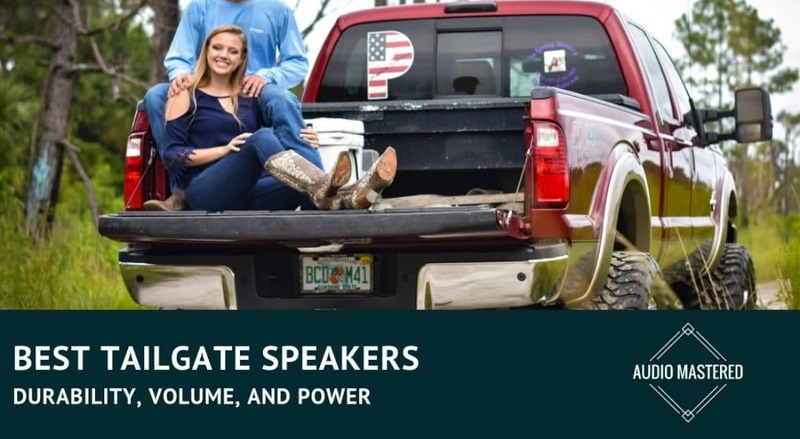 Unfortunately, there are many tailgate speakers promoted to offer you a great experience, no matter the size of the party, but end up failing in both of the most important departments – which include quality and volume. 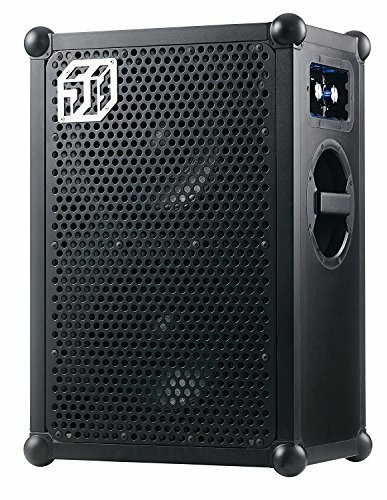 I decided to take a look at the options that are currently on the market in order to bring you the best ones that will surely help you impress the crowd when it comes to hosting a party and setting up your own tailgate speaker to ensure you can show off your speakers and sound system in style. There’s one major difference between a tailgate speaker and Bluetooth speaker – loud volumes for extended times. Conventional Bluetooth speaker aren’t rated to be played at loud volumes for longer periods of time. The parts are too delicate and usually end up braking much sooner than we’d like. Let’s try to avoid that with our tailgate speakers shall we? In this guide, you’ll discover five of the best tailgate speakers currently out there, and I’ll provide you with a buying guide to help you understand the specific factors that you should take into account while you are searching for the perfect product to buy. I’ve written other guides on similar speakers so I’m familiar with the market. You can check out my guide on the loudest portable Bluetooth speakers here. But those speakers aren’t necessarily the best when it comes to tailgate speakers. Because you won’t be carrying the tailgate speaker very far we can sacrifice some of the portability requirements. Keeping this in mind, I filtered through all of the popular speakers to find the best ones that you can currently buy. Below, you will find my top five choices for anyone looking to buy a new tailgate speaker. First on our list is one of the top-rated tailgate speakers that have made quite an impression amongst party people all over the world. It’s one of the loudest speakers that actually produces quality sound at high volumes. The Soundboks 2 comes with a range of high-quality internal components in order to give you the best experience in terms of both sound quality and, of course, volume. While delivering such powerful components and performance, the product was also developed to be portable so that it can easily be moved around from one location to the next without having to worry about carrying an exceptionally large object with you. The Soundboks 2 offers a 122dB supreme sound system that ensures your sound will not only reach the back of the crowd but also be crystal clear in order to avoid distortion. Furthermore, the military grade battery added to the device allows you to continue playing music on the speaker for as long as 40 hours without a recharge. This is one of the best batteries in such a system that you will find available on the market right now. Next on our list is a relatively affordable option that helps you get the performance you need from a tailgate speaker, without breaking the bank. 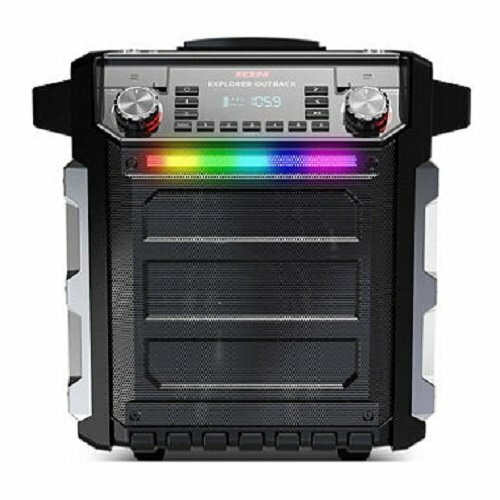 The Ion Explorer Outback Wireless Rechargeable Speaker is available for less than $260 and comes with impressive features, such as a 100 watts power system, along with a shell that is made from an IPX4 waterproof material (not completely waterproof – just protection from splashing), ensuring that you can continue your party even when it starts raining. 100 watts is enough for a regular tailgate party. One user reported their neighbours complaining when the speaker was at half volume so you know it has some punch. Take note, this speaker is NOT Bluetooth compatible. The speaker features a multi-colored bar on the front that lights up according to the music that is being played. Furthermore, the built-in battery in the system can give you continuous playtime for as long as 100 hours at a time before you will need to hook up the speaker to a power source to recharge the battery. The sound quality is actually pretty decent at loud volumes (I would say less so than the Soundboks) – making it a great option if you don’t want to spend over $500. 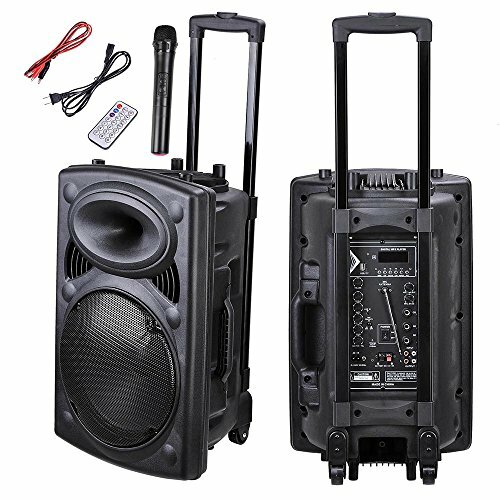 Another cost-effective option that is perfect for hosting a party that needs loud and high-quality sound on a budget is the ECOXGEAR GDI-EXBM901 Waterproof Portable Bluetooth Wireless 100W Speaker. 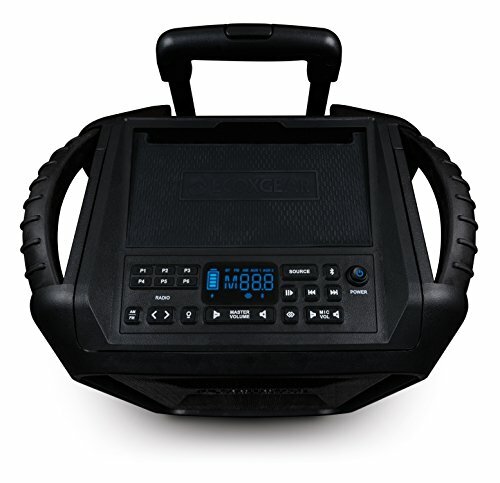 The ECOXGEAR GDI-EXBM901 does not only allow you to play music through Bluetooth but also comes with built-in FM/AM radio features – making it a great jobsite radio. You can continue to play music for up to 10 hours at a time before the speaker’s battery life will run out. Need something that is extremely loud? This is your option. 1200W of speaker power is huge – enough to play for a party of around 200 people. The only downside to this speaker is you’re going to need a power source. This means either hooking it up to your portable generator, or another power source – a 1200W speaker is going to drain your battery pretty fast. This one comes at a very attractive price of just over $100 and offers a 1200W speaker system, giving maximum power in terms of volume, but given the price, you’re going to sacrifice the sound quality. This size of speaker is something you’d find in a portable DJ setup. You can read more about DJ speakers here. The product also comes built into a powerful and durable shell. You can easily connect to the speaker via Bluetooth, or connect an SD card to the speaker to start enjoying some music. The last one on our list is from a very popular brand, Marshall (any guitar players here?) and offers exceptional quality when it comes to the sound quality. The Marshall Woburn Bluetooth Speaker allows you to stream your favorite music wirelessly and the 90W sound output system ensures the sound will reach everyone who is part of your party. In addition to being a great option for streaming sound from a smartphone or laptop via Bluetooth, you can easily connect a turntable or a CD player to the system for extra functionality. 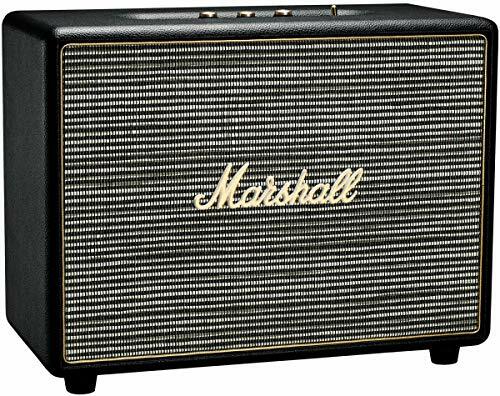 If you’re not partial to Marshall then I don’t see any reason you’d really want to purchase this speaker over the others. However, it’s still a decent speaker in its own right. Now that we have shared our selection of the top tailgate speakers you can buy let’s take a look at some specific factors that you should always take into account while you are looking at the various options that are available. This way, you’ll be able to ensure that you buy a tailgate speaker that is perfect for any event that you may be planning – big or small. The first factor that you should look at when it comes to buying a new tailgate speaker is to ensure that the speaker is able to provide you with the volume that you desire in order to provide sound that will satisfy the ears of everyone who comes to your party. The majority of good quality tailgate speakers that you will find on the market will usually tell you how loud the speaker can go (usually in dB.) But if it doesn’t the power rating will give you a good idea. Don’t settle for anything less than 70W of power – you just won’t be able to get the quality of sound you need at the volume you want. Smaller speakers will end up distorting if you push them at their max value for too long. The amount of distortion at a given volume level is called Total Harmonic Distortion (or THD) and you want this to be as low as possible. Historically, smaller Bluetooth speakers have had issues with keeping the THD low enough. They also have a nasty habit of breaking down if pushed too hard. If nothing else, when it comes to the volume of the speaker, it would be a good idea to take into consideration the reviews that have been left on the product pages of the specific speakers that you might be interested in. People will usually tell in their comments if the speaker is able to provide adequate volume or if the speaker is too soft. This way, you can be sure that the speaker will satisfy your needs in terms of sound volume. The quality of the sound produced by the tailgate speaker you end up buying should be just as important as the actual volume of the sound. There really is no use in buying the loudest speaker on the market if the quality of the sound is going to distort at high volumes. You want a speaker that can produce crystal clear sound without any distortion or clipping. This way, you will not only be impressive in terms of how loud your speakers can go, but the quality and clarity of the sound will also be an impressive factor. Again, take the reviews left by previous customers into account when you try to determine the quality of the tailgate speakers that you are interested in. People are very likely to complain when they buy such a speaker system, and the quality of the speaker is weak – so you will easily be able to determine which tailgate speakers are the better ones in terms of quality. Many people will also provide details when the sound of a particular option is good, so this will help you determine which of these speakers will be able to deliver a better experience by offering clearer sound. Many people tend to forget how important it is to also take the appearance of a tailgate speaker into account. When it comes to a tailgate speaker, people usually do not only want to ensure that the sound impresses the crowd, but they want to show off their speakers in style. With this in mind, do not forget to take into consideration how the speaker actually looks. Many brands pride themselves in making their tailgate speakers as attractive as possible, giving you the ability to truly be impressive in terms of both sound and looks. While there are a lot of tailgate speakers available on the market today, they do not all offer equal quality and volume, both features that you will definitely require when you decide to buy one of these speaker systems. The best overall speaker on the list is the Soundboks 2 while the best value is the Ion Explorer. If you want something rugged and durable then the ECOGEAR is your choice. If you want pure volume and power check out the AW Portable 1200W.